Once upon a time, there was a small family who lived in a very nice part of town. The man, woman and their son lived in a beautiful home on a tree-lined street lined in a lovely neighborhood. Their house was filled with treasures the couple had collected from all over the world before they’d had their son. 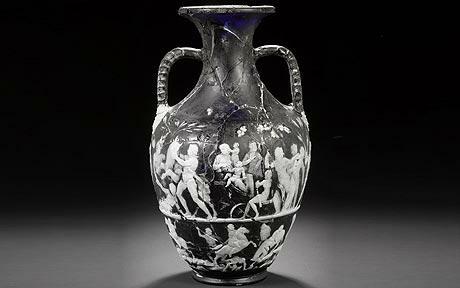 Their most prized possession was an ancient vase. It was so expensive and so rare it was pronounced “vahhzze.” They kept it a special place in the corner of their front parlor. It sat on a stone pedestal, with the lighting in the room designed especially to bring out the most beautiful features of the fine work of art. Needless to say, the room was strictly off limits to the little boy. One day, while the woman was away at work, the man realized he hadn’t heard from his son in several minutes. He rose from his desk where he’d been writing and began to look for the little boy. He checked the boy’s room. Not there. He checked the play room. Not there. He went downstairs and checked the kitchen and living room. Not there either. He knew the boy wasn’t outside because he would’ve heard he door alarm beep if he’d opened it. As a last resort, the father checked the front parlor. All seemed fine…until he noticed that the vase was missing from the pedestal. In a rush, the father ran into the room and found the little boy huddled behind the couch…with his hand stuck down inside the vase. The father helped his son off the floor and into the kitchen where he began to gently and carefully try to pull his arm out of the vase. After several attempts, he realized that there was no way that boys arm was coming out of that vase. They tried soap. They tried olive oil. They tried aloe-vera. They even tried WD-40. No luck. They heard the front door open and close and car keys jingle in the tray on the hallway table. Mom was home. She came into the kitchen and immediately assessed the situation. In a panic, she quickly suggested all the things they’d already tried. They all collapsed on the kitchen floor, exhausted from their attempts to dislodge the boys arm. Defeated, the mother and father looked at each other. They both knew what had to happen. They were going to have to break the priceless vase in order to free their son. They got up off the floor and placed a towel on the kitchen counter and lay the valuable vase on its side on the towel. Then they wrapped another thick towel over the vase. Then the father took a small hammer and, with gritted teeth, he tapped the vase and shuttered as he heard the vase shatter under the towel. The mother slowly peeled back the layers of towel to expose the boys arm along with a million pieces of ancient pottery. The vase was utterly and completely ruined. But that’s not what caught their attention. They looked down to see the boy’s fist closed tightly as if he were holding on to something. They slowly uncurled his little fingers to see a dirty copper penny. A single cent. If the boy would’ve simply let go of the penny, his hand would have easily slipped out of the narrow neck of the vase and it could’ve been saved. For the cost of a tarnished penny, a priceless vase was ruined. What are you holding onto today that’s ruining the priceless things in your life? Maybe it’s time to let go of the junk and embrace the treasure. This was so good! It is exactly what I needed to read today. I love it when God knows what we need to hear or in this case read, and steers us toward the thing that will help us help ourselves.